In Bowling Green, Ky., US, about 12:09 pm CST on Aug. 21, 2017, I first glimpsed a small black bite out of the sun. Now, the actual moon was the black part. It had been 99 years since a total solar eclipse crossed my country from coast to coast. If you learn of such an eclipse nearly three months ahead and guess on easy-to-find lodging within its umbra, guess again. Husband Robin McNallie and I first learned of it in early June from National Wildlife magazine. Seeing no big media reports, I thought, no hurry to Google for lodging. Wrong! Checking a NASA video of the eclipse’s projected 70-mile-wide path from Oregon to South Carolina, I spent frustrating hours seeking hotel vacancies in cities or towns within it. (Sadly, we’ve aged past sleeping comfortably in a tent.) Salem, Ore.? Jackson Hole, Wyo.? Charleston, S.C.? No chance. What about Corvallis, Ore.; Cowheart, Wyo. ; California, Mo.? Nope. Eventually I did nab a room at the Thunderbird Motel in Marysville, Kan.
Then I contacted friends along that path, which inspired Bonnie and Linda, of Lexington, Ky., to seek the eclipse too. This led us to a trip that was more enjoyable as well as 500, instead of what would have been 1,140, miles from home. We cancelled Kansas and the four of us went in on an AirB&B in Bowling Green, Ky.
Robin and I left our home in Virginia (about 400 miles outside the umbra) on Aug. 18 for a leisurely two-day trip to Lexington. While crossing the Appalachians through West Virginia, we stopped to stroll above the New River Gorge Bridge, one of the world’s highest vehicular bridges. We enjoyed a delightful visit with Bonnie, a friend since college, and Linda. Highlights included a watermelon salad with apple turnover and fig and hazelnut gelato at the tree-shaded, outdoor Kentucky Native Café. Our hype-loving Weather Channel had forecast “Eclipse gridlock nightmare!” but our 160-mile drive Sunday from Lexington into Bowling Green was easy because our hosts pulled off a congested highway for back roads they knew. We explored an old church cemetery and kayak landing on Green River. 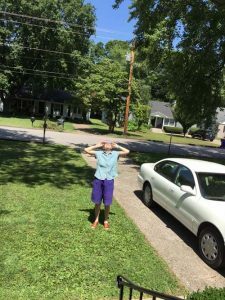 Our AirB&B cost about the price of night in Monaco (don’t ask), with not-quite-perfect amenities, but a fine suburban lawn for eclipse-viewing. As in most eclipse-umbra towns, a public gathering was planned, but our consensus was to stay put. Kentucky was greener than at home. It had obviously gotten more precipitation, but we were fortunate with mostly clear skies that Monday. After breakfast we alternated between watching newscasts of crowds cheering the darkness as it crossed Oregon, Idaho, Wyoming, Nebraska, Kansas, Missouri . 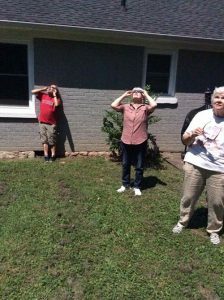 . . and watching the sky through our eclipse glasses. For over an hour we stared as our orangey star became an ever-shrinking crescent. 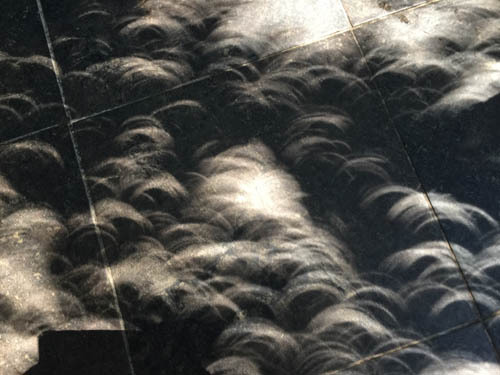 It cast a myriad of images on the patio (providing the easiest photo ops). Totality (c 1:27 CST) was dramatic — sky deeply darkened (though not totally so; that only occurred at the umbra’s center). We shared, with neighbors unseen through shrubbery, a chorus of whoops and cheers. The simultaneous cheering, televised nearby and across America, seemed almost as rare a joy as the eclipse. For that minute or so, the moon covering the sun’s orb appeared pitch-black, surrounded by the sun’s glowing corona. Removing eclipse glasses (safe, for that briefly shaded time), we spotted the Diamond Ring (center of the last visible fragment of sun) and Baily’s Beads (spots of bright light on the corona from valleys on the moon’s horizon). I had just learned that directly photographing the sun in partial eclipse could damage camera lenses, so ordered a lens protector that failed to arrive before we left home. Mindful of the dire warnings, none of us tried to photograph that part. Bonnie and I, photographing the totality with iPhones, each got only what looked like sunbursts. We put our glasses back on to watch the then-partial eclipse slowly wane. At first, back in the small-bite stage, I think I glimpsed the moon’s shady outline beyond the sun’s edge. Near Harrodsburg, we enjoyed a fine-dining experience at the Beaumont, a historic inn where I first tasted a hot brown (deservedly famous Kentucky dish with chicken, ham, bread and cheese). We walked around the Shaker Village of Mount Pleasant Hill. Then Robin and I headed south to parts of Kentucky and Tennessee we’d never explored. Sadly, though we stopped by the famous Mammoth Cave twice, weekday crowds (perhaps drawn by the eclipse) were too large for us to get in a tour. However, we enjoyed the Lost River Cave boat tour on an underground river. Its stalactites remain minuscule, we learned, because sporadic floods wash everything out. Coming in to Nashville, the iPhone charge and storage had both run too low for us to find our reserved hotel by MapQuest’s “easy” GPS-based directions on my new app. In fact, a lengthy, horrendous thunderstorm often made it impossible to see highway lanes. After stopping and waiting it out, stressed, we asked at another hotel for directions and a shuttle driver kindly led us on the convoluted route across the city to our destination. Awakening at 3am, highrise lights reflected through our room’s curtains momentarily appeared as daylight. 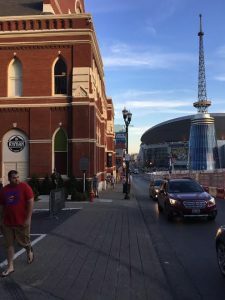 Nashville, we laughed, is a city famously singing celebrations of the down-home simple life while gathering more chaotic traffic than New York. But the dissonance was part of the fun. We dined one night at a honkytonk, another at a jazz club, met some aspiring buskers, and toured the main sites. 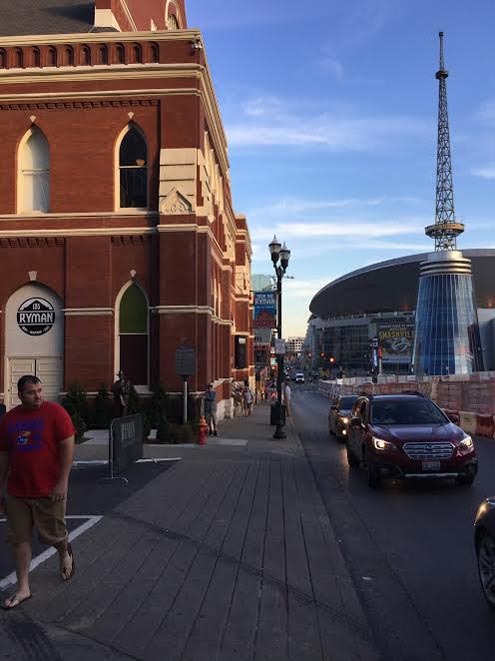 Our favorite was the Ryman Auditorium, the venue antedating the Grand Ole Opry, with a stage trod by Houdini, Theodore Roosevelt, Helen Hayes, Marian Anderson and Louis Armstrong long before Elvis, Hank or Loretta Lynn. We’re more Sixties music than “country” fans, but found surprising blends of styles and cultures. 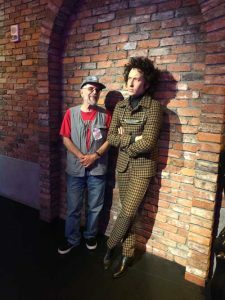 Devotees of both Johnny Cash and Bob Dylan, we treasured a display about collaborations between those two legends crossing generations and followings. Of course, it was also fun finding the Opry’s plaque honoring Old Crow Medicine Show, a band inducted in 2013 that started in our town of Harrisonburg, Va. Old Crow guitarist Critter Fuqua is the son of a friend of Robin’s. We also caught ourselves posing with eerily realistic replicas of stars at Nashville’s Madame Tussauds Wax Museum. We had missed the madding crowds in Nashville days earlier when it was in the umbra, though holdover eclipse traffic lingered. Chattanooga, outside that umbra but known for inventing Moon Pies, seemed quieter. 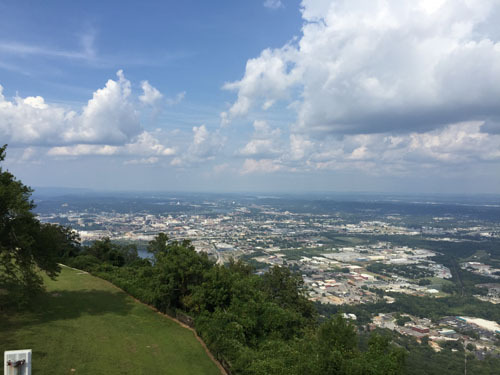 Since the 1890s, Chattanooga’s Incline Train has carried tourists the mile up and down Lookout Mountain. It boasts the world’s steepest grade for a passenger train: 72 percent (as compared with normal railroad grades of 2 to 5 percent). The track looked dizzying (would I scream and cover my face?) — but the slowness and carefully-narrated safety information let me stay quiet and keep my eyes open. Our rewards were, at the top, a breathtaking view of seven states; and following descent, ice cream cones. 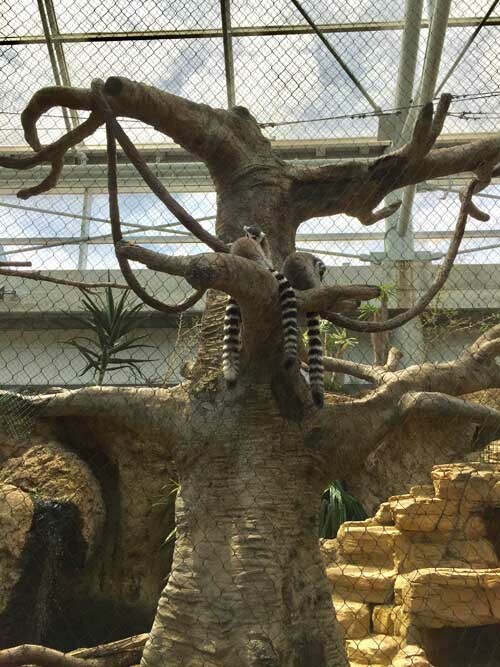 Chattanooga’s Tennessee Aquarium proved a treat by no means limited to fish: ringtail lemurs from Madagascar, with sharp little eyes; small Gentoo and macaroni penguins from the Antarctic, gracefully diving; butterflies in a green and floral habitat, landing on guests’ clothing; and colorful seahorses swimming. We made two forays into Davy Crockett country. Honored as surveyor and founder of Lawrenceburg, Tenn., Davy waves his hat (a wide-brim, not coonskin) from his statue downtown. Tennessee’s Davy Crockett State Park, 340 miles east near Limestone, features a rugged, replica cabin near his birthplace. There, in a “living history” demo, we watched the firing of a black powder rifle. A video reported Crockett losing re-election to Congress because he opposed President Andrew Jackson’s “Trail of Tears” forced removal of the Cherokee (an event I don’t recall from Disney’s depictions in my childhood). Politics – we’d attempted a vacation from it. The TV’s in our rooms remained off. Harrisonburg is 55 miles west of Charlottesville, Va., once my home. Days before starting the trip I’d sat glued to the screen in horror as torch-bearing, self-identified Nazis and KKK strutted across the University of Virginia Lawn where two of my closest family had graduated, and a white supremacist driver deliberately killed a young woman near my long-ago workplace. So, leery of strangers while heading south, I was surprised by the friendliness and good will of many: those who helped us when arriving, lost, in Nashville; the “unidentified third party” whom the waiter told us had paid our bill at the Hyperion diner near Greeneville, Tenn.; and fellow-hotel guests who showed me how to make waffles on the self-serve machines. News on hotel breakfast-room screens that week turned to the season’s first hurricanes – dreadful, yet ironically, like the eclipse, a brief break from our ugly politics. Rescues; lists of ways to donate. In Athens, W.Va., we visited another long-ago college friend, Liz, who teaches at nearby Concord University. Athens nestles among mountains which my app seemed to think were in the Bermuda Triangle. We got lost both arriving and leaving, but the visit was excellent. Arriving home Aug. 31, we learned few here had seen much of the eclipse. My aforementioned grandson (who is studying to be blasé), claimed to be unimpressed by the crescents. Yet I recommend keeping those eclipse glasses. They’re a fun, safe way to view the sun in everyday conditions, and should come in handy for any eclipse. (Another total one will cross North America on April 8, 2024.) Plan your trip early, stock up on eclipse glasses and a camera lens protector, and stay open to surprises.